Make a few of these in an hour and give to your co-workers or anyone else who might appreciate a custom holder for their business cards! 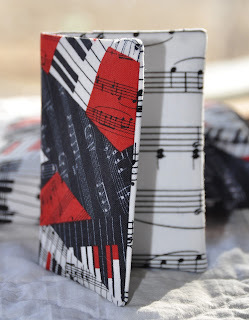 Fabric A - 1 piece 4.25"x5.75"
Fabric B - 1 piece 4.25"x13.75"
If you want your card wallet to be a little stiffer, just fuse some light or medium weight fusible interfacing to the Fabric A piece before you begin! If you want your pockets to match your lining fabric, cut piece B from your lining fabric. If you want them to match the outside cover, cut piece B from the main fabric. I used a red/black music print for the main fabric and a black/white music print for the lining and my pockets are going to match the lining! Take your piece B fabric and lay right side up on your ironing board as shown in the above picture. Fold the left side over 4" and press. Fold the raw edge back to the fold you just pressed and press again. This will make a 2" pocket on the left side. Repeat for the right side. Now your piece B should be the same size as your piece A. Place right sides together, keeping the folds in place. Stitch around the entire piece, leaving an opening for turning (about 1.5") on the middle of one of the long sides. Clip corners and turn right side out. As you turn right side out, you'll be able to see that the pockets can be turned either way - turn them so they are flat against your lining fabric. Poke the corners out so they are square and press. Either top stitch or hand stitch the opening closed. Fold card holder in half and press once more - use a little starch if you want to add some stiffness to the finished project. Tada! You're done! So cute. May work for all those loyalty cards. Pinned to my sewing board. Great tutorial, Magpie ... Thanks! Cool project - I think I can do that!